Background Content: This case study examines the effect of the addition of Prolotherapy to manual therapy, and pelvic and trunk exercises, in a treatment regime for a patient with pelvic and chronic low back pain (CLBP) who had previously failed manual therapy and exercise alone and in combination. We hypothesized that with continued exercise and the combination of Prolotherapy and manual therapy, there would be better improvement than any single intervention to reduce pain and improve stability in the lumbar spine and pelvis. Purpose: The purpose of our case study was twofold. 1. If the tenderness in the above ligaments would be reduced using the combination of Prolotherapy, therapeutic exercise, and manual therapy. 2. Whether our subject would show functional improvement after treatment. Methods: One subject, a 44 year-old male with a history of left L5-S1 laminectomy and ligamentous laxity in the pelvis and sacral ligaments, was assessed and treated by the primary author, using Prolotherapy and manual therapy. Therapeutic exercise was performed five days a week with an emphasis on the pelvic and deep trunk stabilizers. Results: After treatments, the patient demonstrated less tenderness, improved ligamentous stiffness, and displayed improved pelvic joint stability. Function also improved as measured by his ability to work, exercise, and perform home activities with less stiffness and pain than previously noted. Conclusion: Patients with LBP may benefit from Prolotherapy to aid in reducing pelvic and lumbar instability in conjunction with manual therapy and exercise to improve dynamic pelvic stability. 1. The passive stabilizing system, consisting of ligaments, intervertebral discs, and joint capsules. 2. The myofascial system, consisting of muscles and fascia. 3. The motor control processing system, consisting of the central and peripheral nervous systems. The pelvis is a bony ring, composed of two hip (innominate) bones, which are made up of the fused ilium, ischium and pubis, and the sacrum, which is in the center between the innominates posteriorly. There are two sacroiliac (SI) joints, and the sacrum and innominates are joined posteriorly by the synovial-lined sacroiliac joints, and the innominates are joined anteriorly by the symphysis pubis, a fibrocartilaginous articulation.14 The pelvis is a highly significant part of the body that transfers loads between the ground and the spine, as well as transfers loads between the upper and lower extremities, through the spine and thoracolumbar fascia.15 The shape and orientation of the articular surfaces has been described by Vleeming et al., as contributing to the relative passive stability of these joints, known as “form closure.”16 Normal forces applied to the SI joints can enhance stability, dubbed “force closure” by Vleeming et al17 but poor stability in the SI joint can lead to dysfunctions in the lumbar spine and hip. Figure 1. 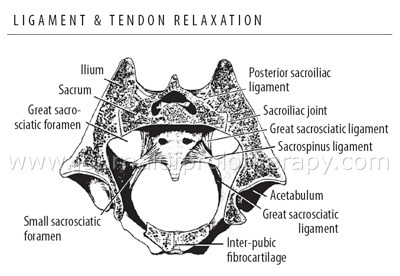 A transverse section through sacroiliac joints. Used with permission from Prolo Your Pain Away! Curing Chronic Pain with Prolotherapy, Third Edition; Ross A. Hauser, et al. Beulah Land Press, 2007, Oak Park, IL. HOW DOES THE PROLOTHERAPY PROCESS WORK? Table 1. Prolotherapy solutions and their effects and usage. References: A Reeves, 2003, B Khan, 2008, C Tsatsos, 2002, D Scarpone, 2008, E Hackett, 1993, F Hauser, 2007. The purpose of this case study was to determine whether or not our subject, who demonstrated specific ligamentous laxity in the iliolumbar, supraspinous, sacrospinous, and dorsal sacroiliac ligaments on clinical examination, would show improvement in ligamentous stiffness and tenderness after the Prolotherapy injections. One male subject, 43 year-old, 69.5 cm tall, and 85.9 kg was included in this case study. The patient had a history of playing competitive hockey for 20 years with multiple associated pelvis and lower back injuries. He wore a onehalf inch lift in the left shoe due to a presumed leg length inequality. He underwent successful decompression laminectomy in December of 1999 to remove an L5-S1 left posterior-lateral disc fragment, which was compressing the S1 nerve root. He also was an avid cyclist during his hockey years and continued to cycle competitively until a recent increase in his pelvis and LBP. On some occasions, especially after hard biking or working out, he reported a sensation of “something shifting” in his pelvis, and afterwards was unable to walk normally or to work without pain. The patient was also not able to sit, flex his trunk, and side flex to the left without discomfort. Driving, cycling, and transitions from sitting to standing and from supine to sitting caused pain. For these reasons, he sought treatment from the primary author. Table 2. Physical findings of objective evaluation for the lumbar spine, pelvis and ligament systems. Figure 2. 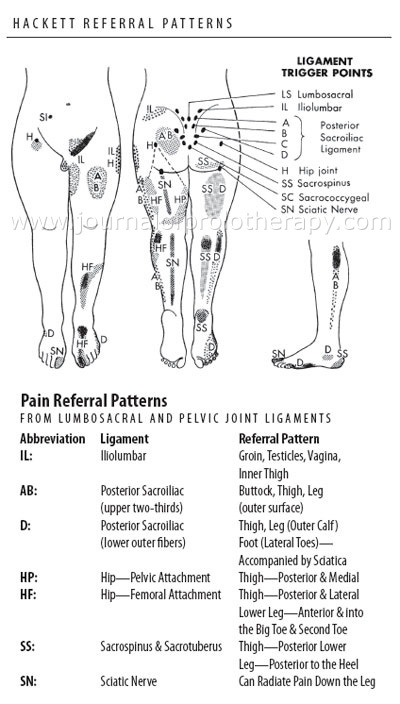 Ligament referral pain patterns. Used with permission from Prolo Your Pain Away! Curing Chronic Pain with Prolotherapy, Third Edition; Ross A. Hauser, et al. Beulah Land Press, 2007, Oak Park, IL. During the physical examination, it was noted that with lumbar extension, the patient reported a “catch” during movement. This “catch” was presumed to indicate lumbar instability associated with segmental dysfunction and/ or lax ligamentous support of the spine. X-ray findings indicated that there were mild degenerative changes in the lumbar spine with mild disc space narrowing at L5-S1. All the segmental dysfunctions were corrected using manual therapy techniques (i.e. muscle energy and/or manipulation) prior to the Prolotherapy procedure. The patient also relayed that using an SI belt was very helpful and took away some of the popping and pain. The lumbosacral region was prepped with sterile alcohol and landmarks were identified prior to the injection procedure. The primary author located the areas of pain or tenderness noted by the patient. Once all the painful ligamentous locations were marked, author one drew up the Prolotherapy solution into a syringe, using a 2 inch, 27 gauge needle. The injection procedure is supported by the work of,35-36, 39, 52 where they stated to inject the needle into the affected area until bone was approximated. Once the bone was found, the needle was drawn out and then the Prolotherapy solution was put into the affected ligament. The Prolotherapy solution used with this patient consisted of 2cc of 50% dextrose, 1cc of PQU (2.43 ml Phenol liquefied, 5.73 GM Quinine HCL, 1.26GM Urea USP), 1cc of Sarapin, and 6cc of 2% Procaine. (Fabricated at the Compounding Pharmacy of Wyoming Park, 2301Lee Street SW, Wyoming, MI 49519) After the injections, the patient was asked to move into lumbar extension to see if the motion still reproduced “catching” or pain in the pelvis or lumbar spine. If the “catching” was present, the physician (author one) reassessed to determine which ligamentous structure needed to be addressed and injected. Post-injection, the patient was instructed to avoid a hard workout for that day, but to perform usual exercises as long as they did not overstress the treated area. The exercise programs we focused on the trunk and “core” muscles. The outcome measures recorded were pain and improvement of functional activity. Treatment consisted of 16 sessions over a six month period. All treatment and assessments were provided by the primary author. Prior to the Prolotherapy treatment, the patient had moderate pain with palpation to the iliolumbar, dorsosacroiliac, sacrotuberous, and the supraspinous ligaments. This was determined by the patient’s subjective rating using a four point Likert scale ranging from zero, to minimal, moderate, and severe. During palpation from the primary author, the pain level was described as moderate. Once the combined treatment of manual PT and Prolotherapy were fully completed, all 16 sessions, the pain was reduced to a minimal level. Functionally the patient could perform pain-free biking, exercise without the lumbar “catching” sensation and was able to return to work without having his SI joint move out of place. The patient could also perform activities of daily life such as yard work, without pain and stiffness which had been present prior to the Prolotherapy sessions. Besides the improvement in function, there was a reduction in hip popping, SI irritation and lumbar spine pain. The popping, pain and loss of function all improved over the course of the treatment. The combination of very specific ligamentous Prolotherapy treatments with the inclusion of manual therapy and exercise resulted in a successful outcome for this patient with pelvic pain and CLBP. Chronic low back (CLBP) and pelvic pain can deter a person from functioning at their optimal level, thus leading to poor productivity and increasing health care costs.5 In order to determine what the cause of the LBP is one must evaluate if the problematic area is a ligament, muscle, disc, or nerve root problem.9 In this case study, we argue for a departure from the traditional pathoanatomical model of dysfunction by emphasizing the interrelationship of the passive and dynamic stabilizing systems of the spine. Attempting to address the weakness without understanding its cause can lead to frustration, poor outcomes, and patient dissatisfaction.58 Our case study supports previous researchers 35-36, 38-39 who showed that the traumatized LD and IL can demonstrate the same referral pattern as a nerve root irritation. We conclude that when patients present with leg pain, injury to the lumbopelvic ligamentous system must not be excluded from differential diagnosis. Our case study also supports the use of Prolotherapy for ligament disorders.41, 45, 47 Despite previous studies by Yelland50 et al, which showed that the injections where not much better than control, our case points up the benefits of today’s Prolotherapy compounds and the synergy of combining manual therapy and exercise with Prolotherapy (Dagenais, et al). Our patient did not see long term lasting effects from just manual therapy and exercise alone or in combination. Once we included Prolotherapy, his recovery was improved and also the positive effects from stabilization exercises and also from manual manipulation were enhanced. By itself, Prolotherapy is an ancillary agent to help tissues heal39, 46-47 and with the inclusion of manual PT and exercise there is a strong beneficial stabilization effect.55-56 Our patient needed the Prolotherapy treatments to improve the integrity of the tissues so that they could respond in a more beneficial manner to the exercise and manual therapy treatments. Researchers have shown that beneficial stress, as provided by carefully supervised exercise, is essential to promote long term positive effects for tissues in the lumbar spine and pelvis.59 Further research is warranted to explore the combination of manual therapy and exercise with Prolotherapy in a scientifically-rigorous way, using blinding and a control group. In this case, it was not until the element of ligamentous insufficiency was addressed by Prolotherapy treatment that the patient experienced significant relief of his pelvic and lumbar spine pain. We take this as evidence that the ligamentous system, at least in this case, was a primary contributor to this patient’s CLBP and further supports the notion that Prolotherapy can be an effective tool in the management of pelvic pain and CLBP in the presence of ligamentous instability. f Hauser RA. Prolo Your Pain Away! (3rd edition) Beulah Land Press: Oak Park, IL, 2007. 6 Guzman J, et al. Multidisciplinary rehabilitation for chronic low back pain: systematic review. British Medical Journal. 2001;322(7301):1511-1516. 7 Jackson M, et al. Multifidus EMG and tension-relaxation recovery after prolonged static lumbar flexion. Spine J. 2001;26(7):715-23. 8 Holm S, et al. Sensorimotor control of the spine. J Electromyogr Kinesiology. 2002;12(3):219-234. 9 Panjabi M. Clinical spinal instability and low back pain. J Electromyogr Kinesiology. 2003;13:371-379. 10 Cholewicki J, et al. Spine Stability: The six blind men and the elephant. Clinical Biomechanics. 2007;22:366-274. 11 Indahl A, et al. Electromyographic response of the porcine multifidus musculature after nerve stimulation. Spine J. 1995;20(24):2652-2658. 12 Snijders CJ, et al. The influence of slouching and lumbar support on iliolumbar ligaments, intervertebral discs and sacroiliac joints. Clinical Biomechanics. 2004;19(4);323-329. 13 Snijders CJ, et al. Effects of slouching and muscle contraction on the strain of the iliolumbar ligament. Manual Therapy. 2008;13(4);325-333. 14 Puhakka KB, et al. MRI abnormalities of sacroiliac joints in early spondylarthropathy: a 1-year follow-up study. Scandinavian Journal of Rheumatology. 2004;33(5):332-338. 15 Gracovetsky SA, et al. Energy transfers in the spinal engine. J Biomed Eng. 1987;9(2):99-114. 16 Pool-Goudzwaard AL, et al. Insufficient lumbopelvic stability: a clinical, anatomical, and biomechanical approach to ‘a-specific’ low back pain. Manual Therapy. 1998;3(1):12-20. 17 Van Wingerden JP, et al. Stabilization of the sacroiliac joint in vivo: verification of muscular contribution to force closure of the pelvis. European Spine Journal. 2004;13(3):199-205. 18 Hollinshead WH, et al. Textbook of Anatomy (4th edition). Philadelphia: Harper & Row; 1993. 19 Pool-Goudzwaard AL, et al. The sacroiliac part of the iliolumbar ligament. J Anat. 2001;199(4):457-463. 20 Pool-Goudzwaard AL, et al. The iliolumbar ligament: its influence on stability of the sacroiliac joint. Clinical Biomechanics. 2003;18(2):99-105. 21 Chow DH, et al. Torsional stability of the lumbosacral junction. Significance of the iliolumbar ligament. Spine J. 1989;14(6):611-615. 22 Yamamoto IM, et al. The role of the iliolumbar ligament in the lumbosacral junction. Spine J. 1990;5(11):1138-1141. 23 Fujiwara A, et al. Anatomy of the iliolumbar ligament. Clinical Orthopedics. 2000;380:167-172. 24 Aihara T, et al. Does the morphology of the iliolumbar ligament affect lumbosacral disc degeneration? Spine J. 2002;27(14):1499-1503. 25 Vleeming A, et al. The function of the long dorsal sacroiliac ligament: its implication for understanding low back pain. Spine J. 1996;21(5):556-562. 26 Vleeming A, et al. Possible role of the long dorsal sacroiliac ligament in women with peripartum pelvic pain. Acta Obstetrics and Gynecology of Scandanavia. 2002;81(5):430-436. 27 Clemente CD. Gray’s Anatomy (13th Edition). Philadelphia: Lea & Febiger; 1985. 28 Dujardin FH, et al. Experimental study of the sacroiliac joint micromotion in pelvic disruption. Journal of Orthopedic Trauma. 2002;16(2):99-103. 29 Hoops H, et al. Short rest between cyclic flexion periods is a risk factor for a lumbar disorder. Clinical Biomechanics. 2007;22(7):745-757. 30 Jackson M, et al. Multifidus EMG and tension-relaxation recovery after prolonged static lumbar flexion. Spine J. 2001;26(7):715-723. 31 Solomonow M, et al. Biexponential recovery model of lumbar viscoelastic laxity and reflexive muscular activity after prolonged cyclic loading. Clinical Biomechanics. 2000;15(3):167-175. 32 Gedalia U, et al. Biomechanics of increased exposure to lumbar injury caused by cyclic loading. Part 2. Recovery of reflexive muscular stability with rest. Spine J. 1999;24(23):2461-2467. 33 Cornwall J, et al. The lumbar multifidus muscle and patterns of pain. Manual Therapy. 2006; 11(1):40-5. 34 McGill S. Low Back Disorders: Evidenced-Based Prevention and Rehabilitation. Champaign, Illinois: Human Kinetics; 2002. 35 Hackett GS. Prolotherapy in whiplash and low back pain. Postgraduate Medicine. 1960;27:214-219. 36 Hackett GS, et al. Prolotherapy for sciatica from weak pelvic ligaments and bone dystrophy. Clin Med (Northfield IL) 1961;8:2301-2316. 37 Hackett GS, et al. Ligament and Tendon Relaxation Treated with Prolotherapy. Oak Park, Illinois: Beulah Land Press; 1993. 38 Hauser RA. Punishing the pain. Treating chronic pain with Prolotherapy. Rehab Manag. 1999;12(2):26-288, 30. 39 Hauser RA. Prolo Your Pain Away! (3rd edition). Oak Park, Illlinois: Beulah Land Press; 2007. 40 Fleming S, et al. CAM therapies among primary care patients using opioid therapy for chronic pain. BMC Complement Altern Med. 2007;7:15. 41 Scarpone M, et al. The efficacy of Prolotherapy for lateral epicondylosis: a pilot study. Clin J Sport Med. 2007;18(3):248-254. 42 Jensen KT, et al. Response of knee ligaments to Prolotherapy in a rat injury model. Am J Sports Med. 2008;36(7):1347-1357. 43 Hooper RA, et al. Retrospective case series on patients with chronic spinal pain treated with dextrose Prolotherapy. J Altern Complement Med. 2004;10;4:670-674. 44 Klein RG, et al. A randomized double-blind trial of dextroseglycerine-phenol injections for chronic, low back pain. J Spinal Disord. 1993;6(1):23-33. 45 Reeves KD, et al. Long-term effects of dextrose Prolotherapy for anterior cruciate ligament laxity. Altern Ther Health Med. 2003;9(3):58-62. 46 Topol GA, et al. Efficacy of dextrose Prolotherapy in elite male kicking-sport athletes with chronic groin pain. Arch Phys Med Rehabil. 2005;86(4):697-702. 47 Staal JB, et al. Injection therapy for subacute and chronic lowback pain. Cochrane Database Syst Rev. 2008;16(3):CD001824. 48 Dagenais S, et al. Prolotherapy injections for chronic low-back pain. Cochrane Database Syst Rev. 2007;2:CD004059. 49 Brandt BV. Inflammation Means Healing. Belgium: Aartsselaar; 2002. 50Yelland MJ, et al. Prolotherapy injections for chronic low back pain: a systematic review. Spine J. 2004;29(19):2126-2133. 51 Ross M, et al. Histology: A text and Atlas. Harpers and Row: Philadelphia: 1985. 52 Dagenais S, et al. Side effects and adverse events related to intraligamentous injection of sclerosing solutions (Prolotherapy) for back and neck pain. A survey of practitioners: Arch Phys Med Rehabil. 2006;87(7):909-913. 53 Bronfort G, et al. Efficacy of spinal manipulation and mobilization for low back pain and neck pain: a systematic review and best evidence synthesis. Spine J. 2004;4(3):335-356. 54 Kim SR, et al. Critical review of Prolotherapy for osteoarthritis, low back pain, and other musculoskeletal conditions: a physiatric perspective. Am J Phys Med Rehabil. 2004;83(5):379-389. 55 Dagenais S, et al. Evidence-informed management of chronic low back pain with Prolotherapy. Spine J. 2008;8(1):203-212. 56 Slade SC, et al. (2006). Trunk-strengthening exercises for chronic low back pain: a systematic review. J Manipulative Physiol Ther. 2006;29(2):163-173. 57 Dutton M. Orthopedic Examination, Evaluation, and Intervention. (2nd ed.) New York: McGraw-Hill; 2008. 58 Meadows JT. University of Maryland, Baltimore, MD; 2005. 59 Nakatani T, et al. Mechanical stretching force promotes collagen synthesis by cultured cells from human ligamentum flavum via transforming growth factor-beta1. J Orthop Res. 2002;20(6):1380-1386.